Dear Applicants, Bureau of Indian Standards has issued notification of 109 Scientist – B Vacancies. This is a great job opportunity for all the candidates who have hold Degree in engineering or Technology stream. Interested candidates can fill Application form for BIS Recruitment 2018 form here through Online Mode. 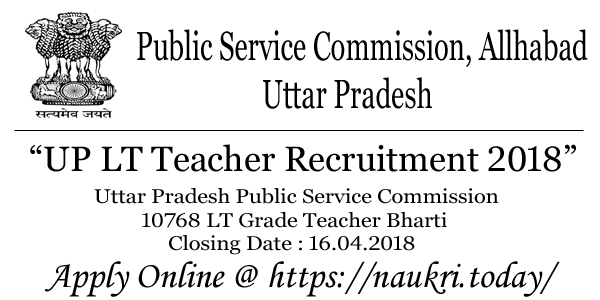 Closing Date for submit Online form for BIS Vacancies is 02.04.2018. Rest of the details about Bureau of Indian Standards Jobs you can collect from below article. BIS New Delhi is inviting online form for 109 Scientist – B Vacancies of Various Trade. Online registration for BIS Scientist Vacancies will started from 16.03.2018. Applicants who are interested must check required Eligibility Criteria & other details before applying BIS Jobs Online form. To get more information about Education, Age, Pay Scale & Selection criteria etc. is mention here, in the below sections. Our team is providing full details about Bureau of Indian Standards Vacancies in this article. Latest Update as on 20.03.2018 : BIS Recruitment 2018 for Scientist -B Vacancy is now available from 16.03.2018. Applicants who are interested can apply online from here through below link. How I Check Required Eligibility Criteria For BIS Recruitment 2018 For Scientist B Vacancies ? 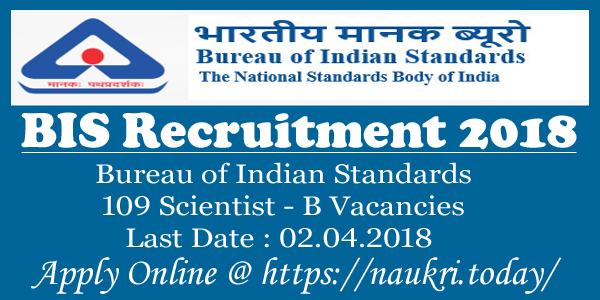 What s the Required Application Fees, Pay Scale & Selection Criteria for Bureau of Indian Standards BIS Scientist Recruitment 2018 ? Dear Applicants, in this section we are providing Subject/ Trade wise division of BIS Scientist Vacancies. You can check more details about Division of BIS Vacancies rom official notification. If you are going to fill online form for BIS Scientist Recruitment 2018 then check required Education & age Criteria from here,. Our naukri.today team is providing full details about eligibility Criteria For BIS Scientist B vacancies in the below sections. Candidates must have done Bachelor’s Degree in engineering or Technology with minimum 60% Marks (50% for SC/ST) from any recognized University for Bureau of Indian Standards Vacancy. For Microbiology Vacancies, Candidates must have passed master’s Degree with 60% marks (50% for SC/ST) from authorized University. Age of the candidates must be not less than 21 years. relaxation in upper age is applicable for reserved category candidates for BIS Recruitment 2018 as per department norms. Criteria of Upper age will updates after publication of Full Advertisement. Candidates of General/OBC Category needs to pay Rs. 750/- as application fees for filing BIs Jobs Online form. Other category contenders are exempted from paying application fees. Fees must be deposited through online mode only. Selected candidates will paid pay band under Level 10 pay matrix for Selected candidates for BIS Vacancies. After joining candidates will paid Rs. 79,929/- per month for Bureau of Indian Standards Vacancies. Candidates will selected for BIS Scientist Vacancies on the basis of written exam & personal Interview. Full details about Examination you can check from here after publication of notification on 16.03.2018. Keep stay with this page for more details about BIS Vacancies. First of all candidates log on to the official website www.bis.gov.in. Now click on Official Bureau of Indian Standards Vacancy Notification. Read all the instruction & Information mention in form. Now deposit Application Fees & recheck all details filled in BIS Jobs online form. Click on submit online form. Conclusion : BIS Recruitment 2018 For 109 Scientist B Vacancies. candidates can fill online form for BIS Vacancies on or before the last date 02.04.2018. Check more details about Bureau of Indian Standards Recruitment Notification from here by reading the above article. BIS Recruitment 2016 :- Bureau of Indian Standard (BIS) has declared for the notification recruitment for filling up 122 Stenographer, UDC, Technical Assistant and other post. vacancies. Eligible and interested candidates can apply for BIS Recruitment from 12-01-2016 to 01-02-2016. Candidates can send online application form through online mode. The organization of Bureau of India Standard (BIS) has released the notification recruitment of 122 Stenographer, UDC, Technical Assistant for various post. Candidate can apply for BIS Recruitment through online mode. For more detail information like Education Qualification, Age limit, Selection process etc. is all mentioned below. Candidates can also check official website www.bis.org.in. Name of Department : Bureau of Indian Standard (BIS). Job Category : Govt Job. Total No. of Post : 122 Post. BIS Required for Education Qualification :- Candidates should have done 10+2, Graduation & ITI Diploma in relevant field from any recognized university or Institute. Age limit :- Candidates minimum age should be 18 years. Age relaxation should be applicable as per Govt rules & regulations. Application fee :- Candidates will pay application fee through Credit/ Debit Card & Net Banking. Selection Process for BIS Vacancy :- Candidates will be selected on the basis of Written exam/ Interview. Note : Candidate can check official website of BIS Recruitment 2016 to get more details about Eligibility Criteria. Candidates should visit the website www.bis.org.in. Read all instruction from advertisement . Then click on “Apply online link”. Now candidates should fill application form without any error. Upload recent passport size photo & required documents on it. Recheck all details before submission of application form. Now candidates should click on submit button. Note down ID & Password which is important. Starting date for Apply Online Registration : 12-01-2016. Last date for Apply Online Registration : 01-02-2016. 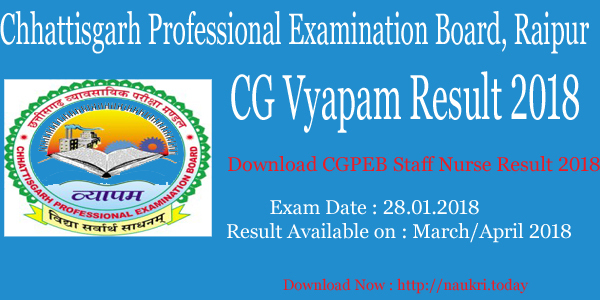 Click Here To get Official Notification of 1-5 Post. Click Here To get Official Notification 2. Bureau of Indian Standard (BIS) has released the recruitment notification for 122 Technical Assistant, UDC, Stenographer post. Candidates who are eligible & interested can submit application through online mode on or before the closing date 01-02-2016.